From the Contributions Screen, click on Reports and then Receipts. Show Itemization - This option shows all contribution amounts by date, including the amounts necessary for IRS purposes. This option is checked by default. Quarterly Format - This option will print the amount given on the receipt broken down by quarter. This option is selected by default. This can be used with any one year time frame that begins on the first of the month. Exclude Non-Deductible - This option will exclude all non-deductible contributions. Non-Tax Deductible contributions will not be included on the receipt. 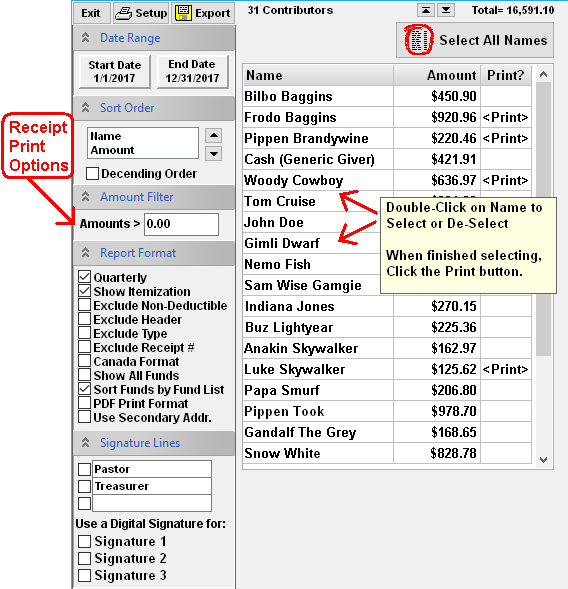 Exclude Receipt # - This option excludes the receipt # from the header. A receipt number will not be printed. Canada Format - For Canadian churches, this option will print the information required by the Canada Revenue agency. The church's Charity BN/Registration # needs to be entered into the Federal ID box in the Church Information setup so that this number will be included on the receipt. Select the Signature lines that need to be printed on the receipt. NOTE: Signatures are NOT required by the IRS for tax deductibility. Select from either the pop up menu or type in a custom signature line name in the white signature line boxes. See the link below for more information. With NTS version 4.70 and above, it is possible to include a digitally printed signature on the receipt. For information about mailing receipts to Contributors in windowed envelopes, see How do I setup Contribution Receipts for windowed envelopes? By default, only contributors that have contributed money are shown on this screen. To print a receipt for every contributor listed, click the Select All Names button. Otherwise, double click on any name to select or unselect contributors. If using the arrow keys to move up and down the list, pressing the space bar will select or unselect contributors. To quickly find a contributor, press the first letter of their last name to go to the contributors that have a last name starting with that letter. Click the button in the upper left corner to print the selected receipts. In NTS version 4.50 and above, all print settings are saved when exiting this screen. The chosen settings will automatically be selected the next time this report is opened..
How do I print digital signatures?